The TAC Roulette- Final Results!!! Re: The TAC Roulette-Now accepting Round 1 submissions. 9. If you are torn between 2 songs for a round, I will allow everyone to use a Wild Card, which means you can send two, and I'll use the best one. You can only use this Wild Card ONCE and this option, for obvious reasons, will NOT be available for the Winger Round. Does that make sense? Is that fair? If those who have already sent for Round 1 want to use their Wild Card in this round, you can send another song. Well, that glam song is not mine indeed. The wild card thing is great. Love that wildcard rule. Totally stealing it for my roulette!. And link has been sent. mp3 will arrive tomorrow for you to rip your CD. Yes that is a very nice rule. I'd use it if I wasn't so smitten with my first choice this round. This Epic Round..............is the 10-15 minute limit an indication of high end range or is the 10 mins a lower limit too ? Hey Tim.....if you have calmed down after comparing woodies with the king , what's the deal ? It's not the 10 to 15 that's important, it's how you use it. Well someone is still aroused. Going on 21 years married anything arouses me. I would prefer the epics in the 10-15 minute range. I don't need 9 Octavariums. OK - I was thinking more at the lower end anyway. My question was more about if less than 10 mins is okay if I still consider it "epic". We all have our own definitions of that term I suppose - some are more focused on length (like the king ) and others it's more about the vibe/structure of the song. You have to feel out (pun intended) how Tim is rating. As the roulette goes on I might have 2 songs ready just incase. If you have already picked out a song for the epic round that is less than 10 or more than 15, don't sweat it. No one will be deducted any points either way. And for others still, it's about girth. Um guys.. This is NOT the Winger Round. Take a cold shower!! I'm only 17 x 2 + 13. Like you've never seen. Just need one more. Hopefully Wolking doesn't have to work Saturday! Alright, I've got a couple of hours this morning, expect something in the next hour! Sorry for being so behind here, but Tim, what format are we sending you the songs? No problem. Youtube really works fine. I can rip and I am putting the tracks on my iPod and will make a CD for my car. Re: The TAC Roulette-Round 1-Everyone's in!! My expectation is to post results Tuesday morning. For the Savatage Round, the only song that I am banning is the title track to Hall Of The Mountain King. It's really the only song that I am familiar with. "Now comes the hard part"
These are the phrases I would expect from Zydar's roulette... not yours. Also... your handwriting is eerily similar to mine. You really can't wait for the Winger Round, huh? 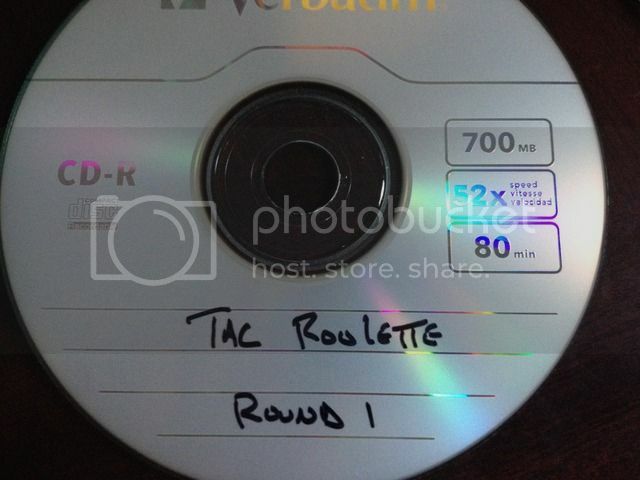 Re: The TAC Roulette-Round 1 CD is burned! That's why we are so giddy. You need your family to video it. You should be tied to a chair.